ATHENS (Reuters) - Greece's four big banks are expected to need a total of about 5 billion euros ($6.9 billion) in extra capital, based on a second stress test by the central bank, two senior banking sources told Reuters on Friday. The estimate, based on figures given by the Bank of Greece to each of the four banks, is subject to approval by the country's "troika" of international lenders overseeing its bailout. 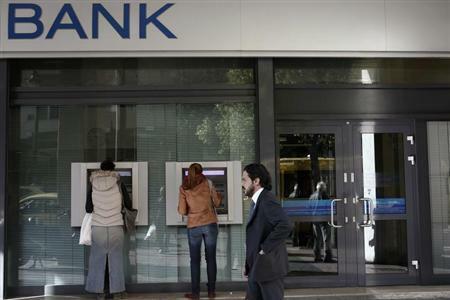 The central bank conducted a second health check on the country's top four banks - National Bank NBGr.AT, Alpha Bank ACBr.AT, Piraeus Bank BOPr.At and Eurobank EURBr.AT - to assess whether last summer's 28 billion euro recapitalization has left them capable of absorbing future shocks as bad loans keep rising. "Each bank was told of its own capital need based on the stress test but subject to final confirmation and approval by the troika," one banker told Reuters, declining to be named. "The estimate for the total capital need is about 5 billion euros," the banker said, without disclosing what individual banks would require. Protracted talks with the troika of European Union, International Monetary Fund and European Central Bank inspectors have delayed the outcome of the tests, which were expected early last month. The Bank of Greece held off releasing the results as the troika had not cleared whether the capital needs will be based on a baseline or adverse scenario that assumes two more years of recession, or whether the required capital ratio can be reduced to 8 from 9 percent.